Why are there sacrifices in the Torah? This seems so ancient and counter-productive. Well remember the Torah is a very ancient document! And are the sacrifices relevant today? One of the great debates of the ages is the relevance of the Torah for today. The idea of animal sacrifice is one of the talking points of this great debate. Some of the other obvious talking points are slavery, polygamy, inequality for women, sexual purity, and homosexuality. As technology changes do the rules change? If we could, should we return to the ancient Torah specifics? This debate was in full swing over a thousand years ago, and we have some of the greatest minds of humanity weighing in on the subject. 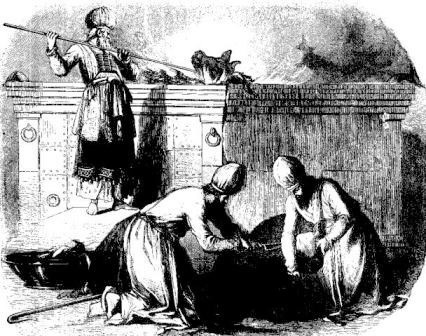 From Rabbi Linzer’s blog: Rambam states that worshipping God through animal sacrifices is not ideal, but the people at the time of the Giving of the Torah could not conceive of any other form of worship. If they would have been forced to choose between worshipping God with prayer or worshipping pagan gods with sacrifices, they would have chosen the latter. Thus, God conceded to them their need to use sacrifices, but demanded that they be brought to God and brought in a way which did not lead to idolatry. So is the Torah written to guide our human needs, or is it some sort of “absolute truth?” Well this should get you thinking on the larger issues of Torah, G~d, and the relevance of the Biblical records for life today.